The Public Theater in New York has received an additional $100,000 grant from the federal government, fresh off its controversy for staging a Julius Caesar production where a Donald Trump lookalike is assassinated. Just days after controversy over the graphic mock Trump killing began, the National Endowment for the Arts announced its newest round of grants. The Public Theater received $100,000 for its New York Shakespeare Festival. This time the theater will do performances of A Midsummer Night's Dream. "Performances will take place outdoors at Central Park's Delacorte Theater, bringing together a diverse audience with renowned classical performers and young, emerging actors of all backgrounds and experience," according to the June 14 grant announcement. 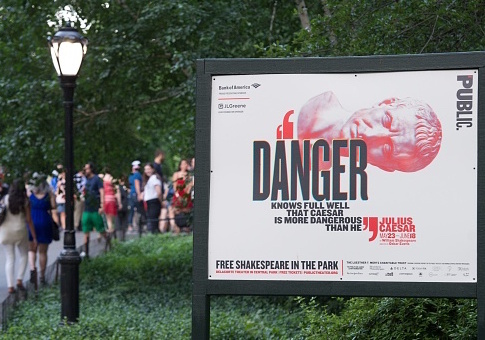 The NEA denied that any previous funding went to the production of Julius Caesar, but said, "In the past, the New York Shakespeare Festival has received project-based NEA grants to support performances of Shakespeare in the Park by the Public Theater." While the government is not shying away from the theater after the controversy, other corporate sponsors have. Bank of America and Delta Airlines pulled funding following the graphic images from the play, and attention from the Trump family. "I wonder how much of this ‘art' is funded by taxpayers?" asked Donald Trump Jr. in a tweet. The taxpayer transparency group OpenTheBooks.com reported that the New York Shakespeare Festival, which is the parent company of the Public Theater, has received nearly $30 million in federal, state, and city grants since 2009. The Public Theater's rendition of Julius Caesar portrayed Caesar as a blond businessman who is brutally stabbed to death. Corey Stoll, the actor who played Marcus Brutus, defended the play that used a Trump lookalike as "nuanced" art. The cast was "exhausted and nervous" and left in tears after the play provoked counter protests from Trump supporters who interrupted performances, he said. This entry was posted in Culture and tagged Government Spending, Government Waste, NEA, New York City. Bookmark the permalink.